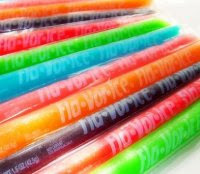 For Marge's playful wedding, Fla-Vor-Ices, of course! Also known as Otter Pops in other parts of the world, and perfect in big galvanized steel tubs filled with ice (and beer). Although Marge had an entirely practical concern when I mentioned these to her-Do they stain? I'm guessing yes. 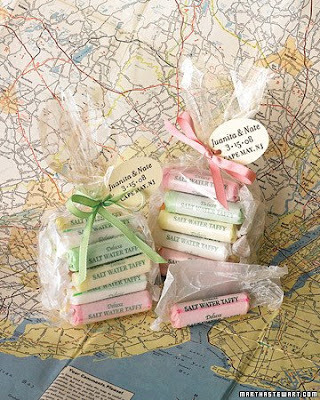 But the favor I love for Marge is salt water taffy, a Jersey beach staple which happens to be one place she's happiest. While I'm not sure she'd go for the packaging in this image, c/o Martha Stewart Weddings, I can imagine big pails full of these delicious, chewy treats at Marge's relaxed reception.